This is the 2nd Construction Phase Monthly EM&A Report for the Project which summarizes the monitoring results and audit findings of the EM&A programme during the reporting period from 1 February 2016 to 29 February 2016. The key construction activities of Contract P560(R) Aviation Fuel Pipeline Diversion Works (Contract P560(R)) in the reporting period involved required site preparation works, erection of site hoarding, construction of temporary concrete footings. This will be followed by construction plant mobilization and installation before any drilling works would begin. Dust suppression measures including wheel washing, watering, covering of excavated materials and establishment of site hoarding have been implemented. Construction of site drainage is also in progress for better management of site runoff. The monthly EM&A programme was undertaken in accordance with the Updated EM&A Manual of the Project. 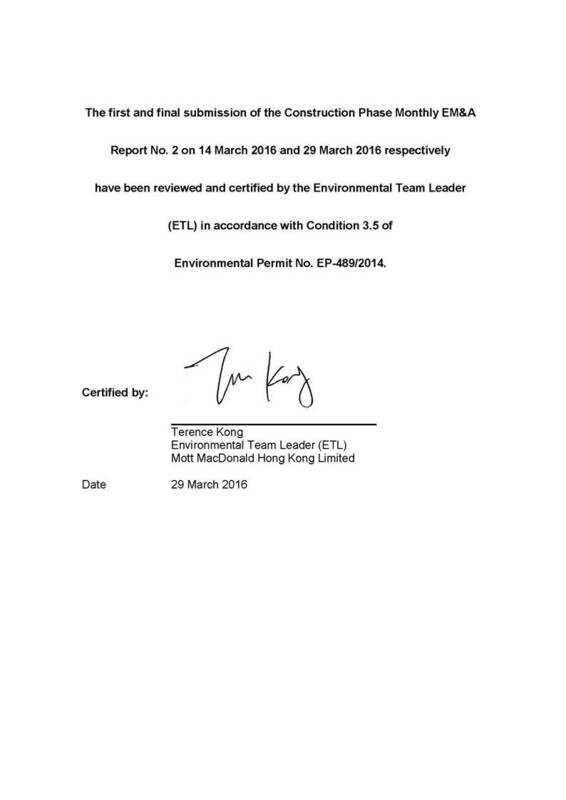 During the reporting period, the ET conducted thirty-six sets of air quality measurements, twenty sets of construction noise measurements, as well as five environmental site inspections and waste monitoring for the Project’s construction works. On the implementation of the Marine Travel Routes and Management Plan for High Speed Ferries of SkyPier (the SkyPier Plan), the situation has been considerably improved in February 2016 by undertaking of workshop training, ferry movement monitoring/audit and implementation of preventive measures. Potential deviations from SkyPier Plan were first identified by the automatic identification system (AIS) monitoring system and notices were issued to concerned ferry operators. Ferry operators had to provide further information and valid reasons for the deviations. The deviation case were reviewed by ET and checked by IEC against the SkyPier Plan. 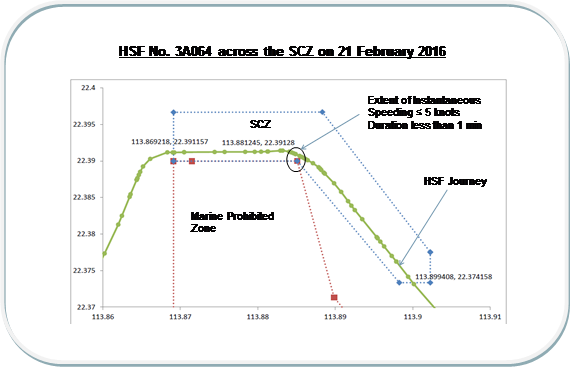 The prevailing speeds of SkyPier HSFs in the Speed Control Zone (SCZ) were all within 15-knot in February 2016. Deviations were only found in the instantaneous speed recorded across the SCZ. Regarding the reason(s) for speeding, the concerned ferry operators advised that most of the cases were related to local strong water current, including those associated with head-on large vessels such as container and ocean-going vessels, as well as anchored vessels. In those cases, the HSF captains considered that speeding up or overtaking for a short duration was necessary for public safety. The remaining few over speeding cases and route deviations were followed up with preventive measures to be implemented by the concerned operators for continuous improvement. The daily movements of all SkyPier HSFs in February 2016 were within the maximum daily cap number. The implementation and monitoring requirements stipulated in the SkyPier Plan were fully complied with. ¡ Topographic survey at Sha Chau. The key environmental issues will be associated with dust and noise generation, surface runoffs and construction waste management and the implementation of required mitigation measures by the Contractor will be monitored by the ET. This is the 2nd Construction Phase Monthly EM&A Report for the Project which summarizes the key findings of the EM&A programme during the reporting period from 1 to 29 February 2016. During the reporting period, construction works under the Contract P560(R) Aviation Fuel Pipeline Diversion Works (Contract P560(R)) involved site preparation works including the erection of hoarding and construction of temporary concrete footings at the horizontal directional drilling (HDD) launching site located at the west of the airport. The erection of site hoarding was also undertaken by the P560(R) Contractor at the stockpile area located near Chun Ming Road adjacent to Tradeport Logistic Centre on the airport island. Site office setup has been commenced at a vacant site near the Chek Lap Kok Fire Station at Catering Road East. The HDD launching site and stockpile area are around 3 km and 900 m away respectively from the nearest air and noise sensitive receivers in Tung Chung and the villages in North Lantau. No Construction and Demolition (C&D) material was generated during the reporting period. The locations of the P560(R) works areas and site office are presented in Figure 1. A pre-construction egretry survey at Sha Chau was conducted between April and July 2015. The Egretry Survey Plan was submitted to EPD on 19 February 2016 under EP Condition 2.14. A pre-construction phase dive survey for corals along the northern and northeastern seawall of the airport island and at the daylighting location on Sha Chau was undertaken and completed on 29 January 2016. Taking into account the nature of the land-based construction works involved in the P560(R) Contract, the required impact monitoring focused on those environmental aspects including air quality, noise and waste management that are relevant to the land-based construction works as recommended in the Updated EM&A Manual. In accordance with the Updated EM&A Manual, baseline 1-hour total suspended particulate (TSP) levels at the two air quality monitoring stations were established as presented in the Baseline Monitoring Report (Version 1 dated December 2015). Impact 1-hour TSP monitoring was conducted for at least three times every 6 days. The Action and Limit Levels of the air quality monitoring are provided in Table 2.2. The air quality monitoring schedule involved in the reporting period is provided in Appendix C.
The portable direct reading dust meter is calibrated every year against high volume sampler (HVS) to check the validity and accuracy of the results measured by direct reading method. The latest calibration certificates of the portable direct reading dust meter are provided in Appendix B. The corresponding calibration record of the HVS is also given in Appendix B. In accordance with the Updated EM&A Manual, baseline noise levels at the noise monitoring stations were established as presented in the Baseline Monitoring Report (Version 1 dated December 2015). Impact noise monitoring was conducted at least once per week in the form of 30-minute measurements of Leq, L10 and L90 levels recorded at each monitoring station between 0700 and 1900 on normal weekdays. The Action and Limit levels of the noise monitoring are provided in Table 3.2. The construction noise monitoring schedule involved in the reporting period is provided in Appendix C.
Weekly monitoring of the Project construction works were carried out by the ET on 1, 3, 12, 19 and 24 February 2016 to check and monitor the implementation of proper waste management practices during the construction phase. The P560(R) Contractor has implemented waste management practice on-site. No C&D material was generated during the reporting month. The P560(R) Contractor was advised to properly maintain a recording system, maximize the reuse of C&D materials and properly maintain the site tidiness. No chemical waste was generated during the reporting period. However, the Contractor was reminded that chemical waste containers should be properly handled and stored temporarily in designated chemical waste storage area on-site in accordance with the Code of Practise on the Packaging, Labelling and Storage of Chemical Wastes. Weekly site inspections of the construction works were carried out by the ET on 1, 3, 12, 19 and 24 February 2016 to monitor the implementation of proper environmental pollution control and mitigation measures for the Project. The site inspection on 24 February 2016 was conducted by the ET in the presence of EPD’s inspectors when they visited the Project site. Bi-weekly site inspections were also conducted independently by the Project’s IEC on 3 and 19 February 2016. Observation has been recorded in the site inspection checklist and passed to the Contractor together with the appropriate recommended migration measures where necessary. The key observations from site inspection and associated recommendations were related to the requirements of displaying non-road mobile machinery (NRMM) label on an excavator used onsite, establishing tree protection zone for the existing trees to be retained at the stockpiling area, and fixing a broken temporary hoarding at the HDD launching site. All the observations have been rectified and closed out within 1 week. Dust suppression measures including wheel washing, watering, covering of excavated materials and establishment of site hoarding have been implemented. Construction of site drainage was also in progress for better management of site runoff. 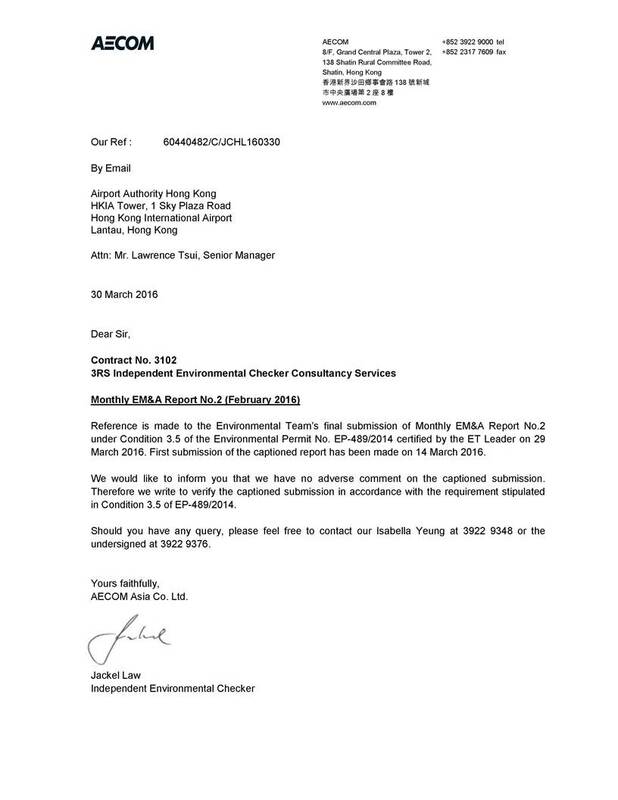 The Marine Travel Routes and Management Plan for High Speed Ferries of SkyPier (the SkyPier Plan) has been submitted to the Advisory Council on the Environment (ACE) for comment and subsequently submitted to and approved by EPD in November 2015 under EP Condition 2.10. The approved SkyPier Plan is available on the dedicated website of the Project. In the SkyPier Plan, AAHK committed to implement the mitigation measure of requiring high speed ferries (HSFs) of SkyPier travelling between HKIA and Zhuhai / Macau to start diverting the route with an associated speed control across an area (i.e. 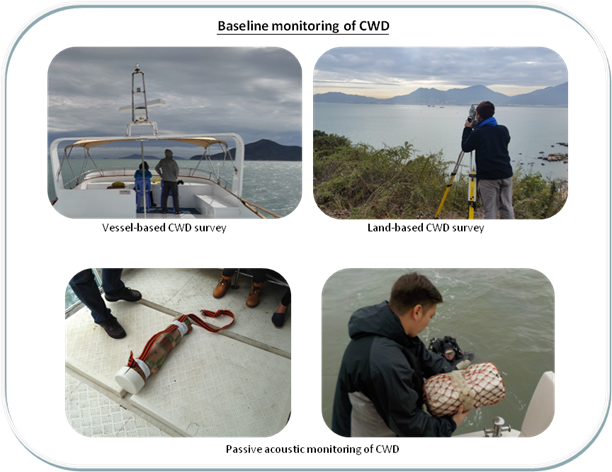 Speed Control Zone (SCZ) with high Chinese White Dolphin (CWD) abundance by the end of 2015. The route diversion and speed restriction at the SCZ have been implemented since 28 December 2015. During the initial implementation period, the SkyPier HSFs encountered occasional difficulties in strictly observing the 15-knot speed limit throughout the journey. In accordance with the SkyPier Plan, further training workshops for the SkyPier operators were held in January 2016 to ensure their full understanding of and adherence to the routing and speed control requirements. The situation has been considerably improved in February 2016 by undertaking of workshop training, ferry movement monitoring/audit and implementation of preventive measures. Potential deviations from SkyPier Plan were first identified by the monitoring system and notices were issued to concerned ferry operators. Ferry operators had to provide further information and valid reasons for the deviations. The deviation case were reviewed by ET and checked by IEC against the SkyPier Plan. The prevailing speeds of SkyPier HSFs in the SCZ were all within 15-knot in February 2016. Deviations were only found in the instantaneous speed recorded across the SCZ. 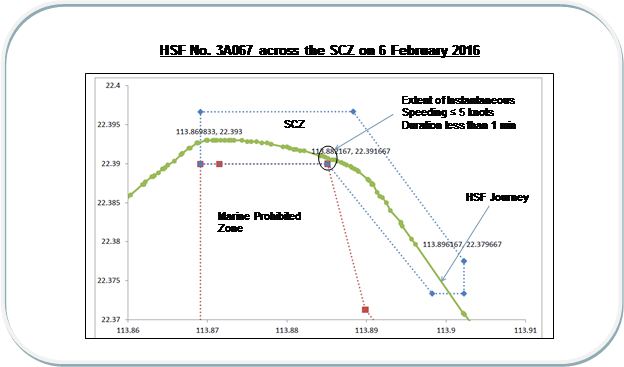 Data of SkyPier HSF Movements to/from Zhuhai and Macau (between 1 and 29 February 2016) is provided in Appendix G.
The following two graphs plotted by using data from automatic identification system (AIS) monitoring system are typical examples of instantaneous speeding of HSFs across the SCZ. Regarding the reason(s) for speeding, the concerned ferry operators advised that most of the cases were related to local strong water current, including those associated with head-on large vessels such as container and ocean-going vessels, as well as anchored vessels. In those cases, the HSF captains considered that speeding up or overtaking for a short duration was necessary for public safety. The remaining few over speeding cases were followed up with preventive measures to be implemented by the concerned operators for continuous improvement. Key audits findings for the SkyPier HSFs travelling to/from Zhuhai and Macau against the requirements of the SkyPier Plan during the reporting period are summarizes in Table 5.1. The daily movements of all SkyPier HSFs in February 2016 were within the maximum daily cap number. Status of compliance with annual daily average of 99 movements will be further reviewed in the annual EM&A Report. The implementation and monitoring requirements stipulated in the SkyPier Plan were fully complied with. · For the case on 6 February 2016, one SkyPier HSF not leaving the SCZ through the Gate Access Points was recorded. Notice was sent to the Ferry Operator and investigation has revealed that the deviation was due to giving way to a large container vessel. · For the case on 14 February 2016, one SkyPier HSF was found using the old route to the north of the HKIA instead of the diverted route. Notice was sent to the Ferry Operator and the vessel captain claimed that due to low visibility and adverse weather, he decided to travel along the waters to the north of HKIA with a slow speed for the interest of public safety. Weather data supported that the visibility was decreased during the concerned period of the incident. Investigation results also showed that although this HSF did not travel the SCZ through Gate Access Points, the vessel had followed the 15-knot speed restriction during the whole journey to the north of the HKIA waters. · Another deviation case recorded on 22 February 2016 was also related to safety reason. The HSF entered the Marine Prohibited Zone after leaving the Gate Access Points of the SCZ. Notice was sent to the Ferry Operator and investigation has revealed that the HSF was required to give way to other vessels by entering the Marine Prohibited Zone and that the vessel had travelled within the SCZ through Gate Access Points and followed the 15-knot speed restriction during the whole journey in the SCZ. 1. The prevailing speeds of SkyPier HSFs in SCZ were all within 15 knots. 3. Reasons for 48 deviations include local strong water current and giving way to other vessels. Three deviations were due to unclear gate demarcation for the SCZ that required further training for familiarisation of the entrance / exit points for the speed control. During the reporting period, environmental related licenses and permits required for the construction activities were checked. No non-compliance with environmental legislative requirements was recorded during the reporting period. The environmental permits, licenses, and/or notifications on environmental protection for this Project which applied or approved under this Project during the reporting month is presented in Appendix E.
The Egretry Survey Plan was prepared based on the pre-construction survey and was submitted to EPD on 19 February 2016 in accordance with EP Condition 2.14 to update the latest boundary of the Egrety with a view to confirming the daylighting location for the horizontal directional drilling (HDD) works on Sha Chau island. The key construction activities of the Contract P560 Aviation Fuel Pipeline Diversion Works in the reporting period involved site preparation works, including erection of site hoarding at the horizontal directional drilling (HDD) launching site and stockpile area, and construction of temporary concrete footings at the launching site. Dust suppression measures including wheeling washing, watering, covering of excavated materials and establishment of site hoarding have been implemented. Construction of site drainage is also in progress for better management of site runoff. Construction dust, noise and waste monitoring were carried out in the reporting period. No breach of the Action or Limit Levels in relation to the air quality, construction noise and waste monitoring were recorded in the reporting month. Environmental weekly site inspections were carried out during the reporting period by the ET. All site observations made by the ET were recorded in the site inspection checklists and passed to the Contractor together with the recommended follow-up actions. On the implementation of the SkyPier Plan, the situation has been considerably improved in February 2016 by workshop training, ferry movement monitoring/audit and implementation of preventive measures. The prevailing speeds of SkyPier HSFs in the SCZ were all within 15-knot in February 2016. Deviations were only found in the instantaneous speed recorded across the SCZ. Regarding the reason(s) for speeding, the concerned ferry operators advised that most of the cases were related to local strong water current, including those associated with head-on large vessels such as container and ocean-going vessels, as well as anchored vessels. In those cases, the HSF captains considered that speeding up or overtaking for a short duration was necessary for public safety. The remaining few over speeding cases and route deviations were followed up with preventive measures to be implemented by the concerned operators for continuous improvement. The daily movements of all SkyPier HSFs in February 2016 were within the maximum daily cap number. The implementation and monitoring requirements stipulated in the SkyPier Plan were fully complied with.